1564, Narrai valley in present day Madhya Pradesh; amidst hills surrounded by Narmada River, She was valiantly defending her land from Mughal army, riding on Sarman, her elephant, when the arrows struck her; one in the neck and another in her temple. She pulled them out but had lost so much blood in effect that she fell unconscious. Moments later when she regained her senses, she was witnessing a brigade of brave men – half resting on ground wrapped in blood, some without their heads, and others trying to defend their fellowmen; who had given their lives to live their Queen’s motto “better to die respectfully than to live a disgraceful life”. Her eyes were moist but tears won’t come out, for her stature, tears wouldn’t dare disregard her courage; there was still some fight left in her, the final blow to Mughal’s arrogance. So the tears were held at the brink, witnessing the brave. Inside, she knew the battle was lost. Her Commander was dead and young son was wounded. “Take this dagger and kill me”, she asked her mahaut. Hesitant, humbled mahaut was defiant, confused of duty and honor – “How could I kill my Queen?”, he thought. “Swing this dagger, damn it! Your Queen commands!” she shouted. Trembled mahaut couldn’t muster the courage. Standing tall on the rock, just above the ground; Rani Durgavati took the dagger and stabbed herself in the chest; it’s unclear whether the dagger felt victorious of slashing a brave warrior or cursed itself for its existence to have brought a patriot to this end. Rani passed her last sentence upon herself, and her last words flew like the birds, the messengers of peace resonating for years in the folklore. She held her pride, her honour; she chose to embrace death over surrendering to the army of Asaf Khan, the General of Akbar. Oh, she was as much a beauty to be cared for 22 years ago, when King Dalpat met her! Durgavati was born to Rajput Chandel Keerat Rai and was raised with suitable training in horse riding and sword fighting. For as courageous woman she was, Durgavati was fond of hunting and was a kind hearted woman for the people. She upheld her family tradition by taking keen interest in art and literature, promoting them through various temples in Khajuraho and other places. Stories of her bravery, intellect and beauty soon spread across Kingdoms and reached Dalpat Shah, the then King of Gondwana. 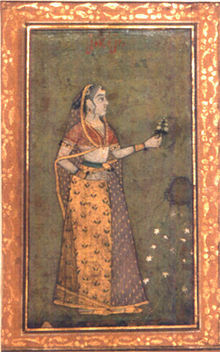 Dalpat Shah had met Durgavati at several occasions. Some stories say that Dalpat protected her from a tiger while she was out hunting. Their story is one of that Royal Romance where Dalpat Shah sent a proposal to Keerat Rai requesting to wed her; which was rejected by Keerat Rai on grounds of caste. However, Durgavati had different beliefs. She considered Dalpat equal with Rajputs for his grandeur and valour. Kingdom of Gondwana has been stopping Mughals from invading down South in India and Dalpat Shah was a respected King among neighbouring kingdoms. Taking the rejection as an insult, Dalpat Shah attacked fort of Kalanjar eventually forcing Keerat Rai to agree for the wedding. Durgavati was now Rani Durgavati caring for a flourishing kingdom at its peak. Rani gave birth to Bir Narayan in 1545, a courageous boy who went on to fight Mughals at an early age. Years passed and as the destiny had it, Dalpat Shah met an untimely death in 1550, leaving Rani Durgavati to take care of Gondwana; which she rightly did. Rani ran the kingdom with as much care as Dalpat would have done himself, fuelling trade, promoting art and literature and safeguarding state’s interest in all ways a ruler is deemed to. Gondwana was choicest of targets for intruders, especially the Mughals. Baz Bahadur, the grandson of Sher Shah Suri and one among the avaricious neighbouring kings, attacked Gondwana. The attack was tastefully responded to and repelled by Rani. Since Bir Narayan, the Prince, wasn’t of age to run the State, Rani had left no stone unturned to help it flourish and also protect it from the opportunists. But it had to change; Rani wasn’t born to be another ruler, but to be immortal through her deeds, her courage. Rani Durgavati had blown Mughal ambitions in to pieces on the same land, in the valley of Narrai with mighty Narmada on one side; when Asaf Khan first attacked upon orders from Akbar. Despite Rani’s efforts for a peaceful settlement, Asaf Khan and in turn Akbar had high ambitions for Gondwana’s treasury; they did not budge. Rani was aware of Mughal’s army and its strength; also that it would be a direct confrontation with a skilled, experienced army supported with heavy artilleries. Diwan Beohar Adhar Simha warned her of unfavourable consequences, but fear wasn’t for this daughter of Rajputana and the Queen of powerful Gondwana. She developed a defensive strategy to face Mughals in a land with advantage, in Narrai valley surrounded by hills and rivers. Mughals attacked her army from two ends, anticipating an easy victory over an army lead by a woman. But history is full of examples, where such lowly ambitions have been averted by sheer resolve, courage, planning, humility and sense of service to one’s land, the matribhoomi. Rani’s army fought heroically pushing the Mughals for retreat and holding the pride of motherland yet again as they did against Baz Bahadur, the ruler of Malwa. The dark clouds weren’t past yet. Rani was proactive in anticipating the reinforcement that Asaf Khan would receive from Mughal headquarters, full of guns and sophisticated weapons. She insisted to attack Khan’s troop during midnight, which unfortunately was rejected by other members of the council. Despite the challenges, she fought the very next day, irrespective of the outcomes, upholding the armour, pride and honour of Rajputana, of Gondwana and whatsoever shall the illuminated minds would like to name their motherland, she stood for it; she didn’t give up. The war conch had fulfilled its duty and so did the morning Sun, who was about to witness another event that would inspire mankind for years to come. The Lady, the Rani, stood on the hills raising her sword high, very high, daring enemies to try and take her pride, which they never could. The dagger dangled honourably besides her all the while, witnessing this piece of history to take shape, for this story to unfold, to wait for its unfortunate moment to be the signatory to this outstanding story; waiting for the HERO’s command to pierce into her chest, to see her die, yet witness her to live forever. Yes, Rani Durgavati will live forever.